I am far from the first person to have talked about the difference between discussion and argument or the pros and cons of each. Just recently, though, I was involved in a conversation about this very topic in a place where discussion was more common than argument. Further, it was observed that the discussion in this particular type of establishment tended to be more enlightening than that of some others. As it happens, I was in a cigar bar involved in a discussion with several other military service veterans. 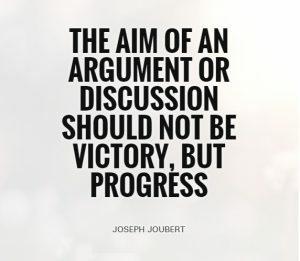 Let’s talk first about the difference between arguments and discussions and then we can talk about the difference between the establishments cited and purposes served by the discussions. Now anyone who has served, or is family to a service member, knows that there will ALWAYS be an argument about which is the best branch of service. Each branch will claim it and make fun of all the others. This isn’t a discussion. This is an argument… albeit a fun one. Everyone involved knows they’re right and that the only people who will ever agree with them are those other veterans from the same branch of service as they are. It’s actually all good fun and games and as such no one really ever has any desire to have it end. That said, when the conversation turns to how each branch accomplishes specific missions, provides particular types of training, etc. then the conversation gets more serious and there’s far less, “Mine’s better than yours ‘cause I said so,” type statements. In the end, though we’d be slow to admit it, we service veterans admit that there will never be an end to the argument over which service is “best.” There really isn’t meant to be. It’s too much fun to disagree. A discussion, on the other hand, about policies, protocols, procedures, etc. 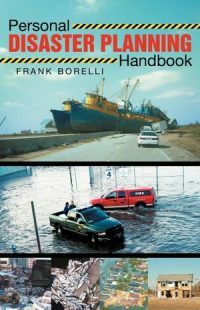 – that’s a more serious conversation and we all approach it from the perspective of trading contemporary best practices so that we can ultimately identify what’s working best; what trains us the best; what’s the best policy or protocol. What accomplishes the mission the best? We’re all happy to learn from each other. 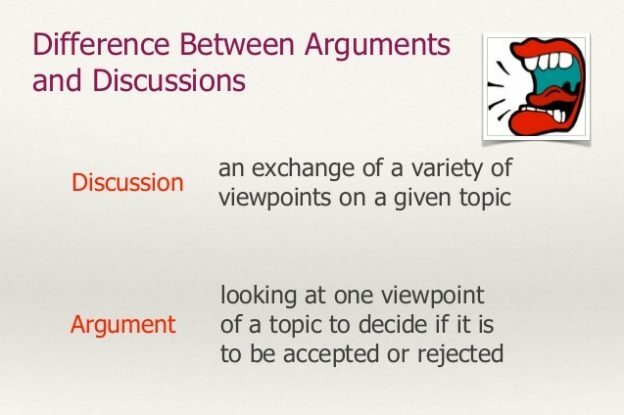 Discussion allows for learning; argument doesn’t – not usually anyway. But why would discussions occur in a cigar bar as compared to a “regular” bar? Several guesses based on socio-economic status were made, but the best answer was: who knows? I used to frequent a cigar lounge that I often compared to the “old world gentlemen’s coffee shop.” It was the place where men gathered to enjoy coffee, relax and discuss the issues of the times. The younger men were welcome but mostly encouraged to keep their mouths shut so they could listen and learn. The elders spoke less and when they did everyone paid attention. 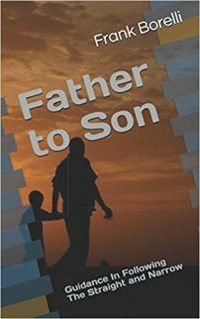 The elders had the most life’s experience to combine with a given topic to offer higher wisdom. That difference identified, why would you think there might be more in depth discussions at a cigar bar as compared to a regular bar. My guesses are setting, noise levels and yes, potentially the economic status of those who attend. It’s been my experience that in a “regular” bar there is a lot more beer consumed, far less high end bourbon and cigarettes get sucked down as fast as the smoker can ingest the smoke/nicotine. That is not meant to sound judgmental because it’s not in any way. It’s just my observation. In the cigar bar, the drinks consumed tend toward the higher end bourbons, scotches, brandies, etc. One cigar can cost as much as a pack of cigarettes (or two or three or more). You don’t smoke a cigar in five or ten minutes. You enjoy a cigar across the span of an hour or more. How do you fill that time? In conversation about a variety of topics with those around you who are enjoying similar amenities. The entire environment and atmosphere supports a more focused and relaxed… almost thoughtful approach to discourse. 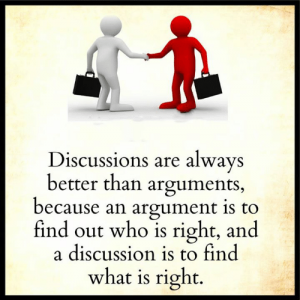 For all that, it’s imperative that we all understand the greater value of discussion over arguments. In today’s world of social media, you can get in an argument with a total stranger every day. You can waste your time stating your position and why you think you’re right. The other person will do the same. Eventually, more often than not, someone will insult someone else and then it just continues to spiral down the drain. If you find yourself talking with someone and all of a sudden you feel like you’re under attack or on the defensive, stop talking for a moment, take a deep breath and ask yourself why you feel that way. Is it because you can’t articulate your position? Or is it because the person you’re talking to has become personally aggressive in their language? Either of these circumstances indicates that the conversation is moving away from the venue of discussion and into the arena of argument. Discussion should be the goal. It’s informative. It’s honorable. It’s educational. It moves us forward individually and as a group – however we define that group. Arguments… can build up your respiratory system and increase your blood pressure at the same time while accomplishing nothing.